petition: Stop the slaughtering of songbirds etc. from U.K. and Europe! Our wildlife is endangered! Pay to shoot companies to blame for massively declining numbers! Stop the slaughtering of songbirds etc. from U.K. and Europe! Our wildlife is endangered! Pay to shoot companies to blame for massively declining numbers! recipient: The authorities - to be advised. 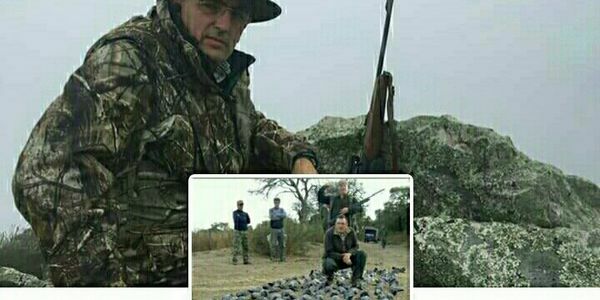 Manuel Dominguez Facebook page https://www.facebook.com/profile.php?id=100007065317292 kills many birds for "fun" and has also made a business out of it Facebook page https://www.facebook.com/sierradeloro/?ref=br_rs and website http://www.sierra-del-oro.com/ including shooting video nasties for his friends and customers to enjoy the death and destruction of songbirds Unfortunately it is no fun for the bird population and if allowed to continue will help to push many species into extinction. Just one example is the Mistle Thrush, which he kills in big numbers with a passion. Along with others doing the same he has helped to bring their numbers down to a bare minimum ~ to the extent that they are no longer seen where they were in countries such as England, as this wanton killing affects the whole bird population. Hen harriers and other endanged species are also killed via the "pleasure" shooting of pheasants, partridges and grouse etc. in The U.K. and other areas. Killing nature for fun can never be a good idea. Birdlife is being wiped out for no good reason at at alarming rate when this practice simply needs to be banned. This should be implemented before any more damage is done.